Hardcover with jacket, 256 pages, 13.5 x 21.5 cm, 5.3 x 8.5 in. The end of the war saw the beginning of fourteen-year-old Anna's struggle. Her mother was long since dead, her father taken prisoner by the Russians, her home country lost. She and her smaller brother fled alone westwards and finally found shelter in Kosakenberg, a village in the Soviet occupation zone. She is taken in by the Wendler family, on whose farm she is forced to do the hardest of physical work. In 1949 Friedrich Stein returns to Kosakenberg from Soviet war imprisonment – a broken man, twenty years older than Anna. One evening, he assaults Anna up in the attic of the house. Nine months later she gives birth to a child. The villagers force Friedrich to marry Anna, who is 18 at the time and has no choice. Anna and Friedrich stay together and have two other daughters. No one ever talks about what happened, until twenty years after Friedrich’s death the truth comes to light. 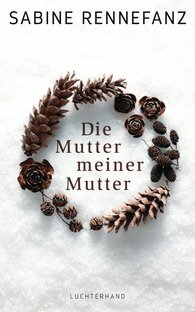 Sabine Rennefanz tells Anna Stein's moving story from the point of view of the grandchildren's generation and shows how brutality and violence haunt even the children and grandchildren of those who survived it. For readers of Johanna Adorján's An Exclusive Love. "Sabine Rennefanz describes this fate in a serene language that makes this story even more forceful."